Fluorine is a halogen that exists under ordinary conditions as a pale yellow diatomic gas. The element is found in fluoridated water, toothpaste, and refrigerants. Here are facts about this interesting element. Word Origin: The name fluorine comes from the Latin and French fluere: flow or flux. Sir Humphry Davy proposed the element name, based on its presence in fluoric acid. The -ine suffix is consistent with the naming of other halogens. However, the element is named fluor in Greek and Russian. In early papers, it is referred to as fluorum. Properties: Fluorine has a melting point of -219.62°C (1 atm), boiling point of -188.14°C (1 atm), density of 1.696 g/l (0°C, 1 atm), specific gravity of liquid of 1.108 at its boiling point, and valence of 1. Fluorine is a corrosive pale yellow gas. It is highly reactive, participating in reactions with virtually all organic and inorganic substances. Fluorine is the most electronegative element. Metals, glass, ceramics, carbon, and water will burn with a bright flame in fluorine. It is possible that fluorine can substitute for hydrogen in organic reactions. Fluorine has been known to form compounds with rare gases, including xenon, radon, and krypton. Free fluorine has a characteristic pungent odor, detectable at concentrations as low as 20 ppb. Toxicity: Both elemental fluorine and the fluoride ion are highly toxic. The recommended maximum allowable concentration for a daily 8-hour time-weighted exposure is 0.1 ppm. Neither fluorine nor its ion, fluoride, are considered trace nutrients for human nutrition. However, fluoride does impact bone strength. Uses: Fluorine and its compounds are used in producing uranium. Fluorine, in the form of fluorite, is added during smelting to help reduce the melting points of metals. Fluorochlorohydrocarbons are used in refrigeration applications. Fluorine is used to produce many chemicals, including several high-temperature plastics. The presence of sodium fluoride in drinking water at the level of 2 ppm may cause mottled enamel in teeth, skeletal fluorosis, and may be associated with cancer and other diseases. However, topically applied fluoride (toothpaste, dental rinses) may help reduce the incidence of dental caries. Sources: Fluorine occurs in fluorspar (CaF) and cryolite (Na2AF6) and is widely distributed in other minerals. It is obtained by electrolyzing a solution of potassium hydrogen fluoride in anhydrous hydrogen fluoride in container of transparent fluorspar or metal. Isotopes: Fluorine has 17 known isotopes ranging from F-15 to F-31. F-19 is the only stable and most common isotope of fluorine. 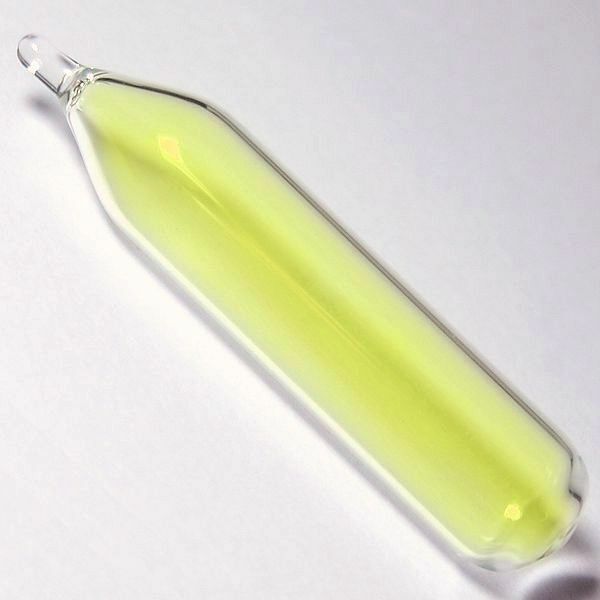 Appearance: At room temperature and pressure, pure fluorine is a very pale, greenish-yellow, pungent, corrosive gas. Liquid fluorine, like chlorine, is bright yellow. Solid fluorine is found in alpha and beta allotropes. The alpha form is opaque, while the beta form is transparent. Fluorine in the form of the mineral fluorite was used in the 1500s to aid in ore smelting. Fluorine was suspected to be an element as early as 1810 but wasn't successfully isolated until 1886. Many chemists trying to isolate the element would be blinded or even killed by the violent reactions that generally accompany fluorine gas. Henri Moissan earned the 1906 Nobel Prize in Chemistry for being the chemist who finally successfully isolated fluorine (and also invented the electric arc furnace). Fluorine is the 13th most common element in the Earth's crust. Fluorine is the 24th most abundant in the universe. Emsley, John (2011). Nature's Building Blocks: An A–Z Guide to the Elements (2nd ed.). Oxford: Oxford University Press. ISBN 978-0-19-960563-7. Greenwood, N. N.; Earnshaw, A. (1998). Chemistry of the Elements (2nd ed.). Oxford: Butterworth Heinemann. ISBN 0-7506-3365-4. Moissan, Henri (1886). "Action d'un courant électrique sur l'acide fluorhydrique anhydre". Comptes rendus hebdomadaires des séances de l'Académie des sciences (in French). 102: 1543–1544. Patnaik, Pradyot (2007). A Comprehensive Guide to the Hazardous Properties of Chemical Substances (3rd ed.). Hoboken: John Wiley & Sons. ISBN 978-0-471-71458-3.